The election of the Palaszczuk Government is good news for first home buyers with the extension of the State Government’s First Home Owner Grant (FHOG) of $20K by six months, expiring on 30 June 2018. This means that contracts will need to be signed by then, and settlement can occur later than this date if the unit hasn’t yet completed construction. This is certainly a plus for buyers’ in their first purchase, however it is important to act quickly as the grant is not guaranteed to be extended again. 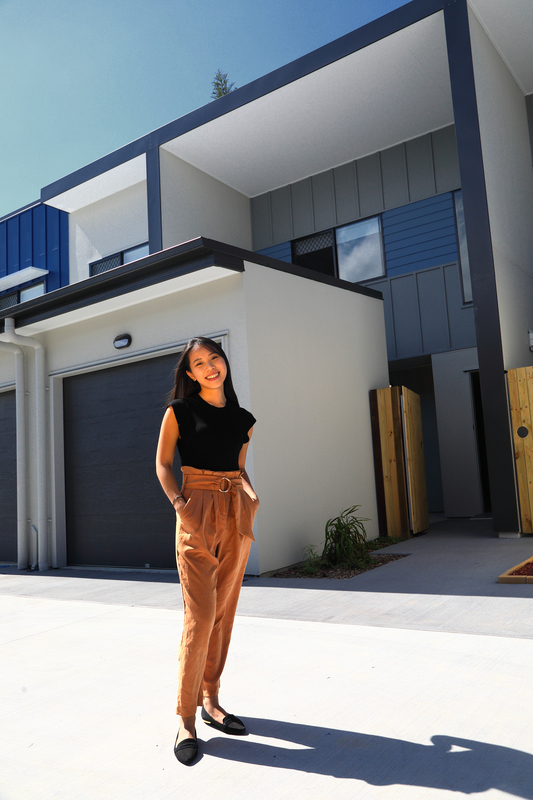 Combining these savings presents first home buyers with an attractive opportunity to buy with other like-minded people in a master planned and affordable development such as Cornerstone Living at Sunnybank. The Cornerstone Living neighbourhood’s newest addition, The Pines, offers affordable 2 and 3-bedroom apartments from $399K. Considering repayments for under $400week*, first home buyers can benefit from buying over renting – something thought to be a thing of the past. The Pines is currently under construction offering elegant open-plan living areas abundant with natural lighting, spacious bedrooms and large entertaining balconies, European appliances and quality finishes, beautiful colour palettes and thoughtful details throughout such as study nooks. These superb elevated north-facing residences will settle in late April of 2018. Kara Fung previously resided in a completed dwelling at Cornerstone Living with her parents and decided to purchase a unit for herself, “I looked around but in the end, Cornerstone Living had the best pricing, location, finishings and I know firsthand that it operates smoothly” she said. Ms Fung mentioned that “Best of all is the location, I work close-by to Sunnybank and often visit Sunnybank and shop at Garden City, it’s so convenient”. Ms Fung used savings for her deposit and is using the FHOG to facilitate her mortgage repayment. When asked whether Ms Fung considered her purchase to be a sound future-proof investment, she stated “Not only was the whole sales process smooth and seamless, but I think the location is a place where people of all ages can live”, Ms Fung added “My new place is located on the park, my dad picks up bread from the bakery nearby and coffee from the Cornerstone café for breakfast on his morning walks. It’s great!”. The neighbourhood is renowned for its great location with Sunnybank Plaza, restaurants, Westfield Garden City shopping, Griffith University, and QEII Jubilee Hospital all under 10 minutes away. Families have access to six primary and secondary schools within 4 kilometres. With so much close at hand, motorways and public transport enable convenient access to Brisbane and the Gold Coast. Public transport services include buses and two train stations with Banoon Train Station being a short 500-metre walk away. For people working in the city, Brisbane CBD is just 15 minutes away. Further infrastructure is planned for the area that will continue to increase connectivity in the coming years. Cornerstone Living is the largest master planned ‘suburban renewal’ project in Queensland. Now in its 5th year, over 250 properties have been developed with more than 500 residents now calling the neighbourhood home. The contemporary homes bring residents and locals together in an exciting new residential hub where family and friends live close-by. In fact, 35% of purchasers are first home owners and chose to purchase at Cornerstone Living because of the designs, location and affordability. Cornerstone Living is delivered by Consolidated Properties Group which is a privately-owned development company, specialising in retail, commercial and residential projects, spanning Australia’s eastern seaboard, with a current development pipeline totalling over $2.1 billion. “It is a simple process to buy at Cornerstone Living, simply visit Ian at the sales office and he will guide you through the whole process. We can even assist with finance and applying for the FHOG. It is a great time to lock in your purchase and take advantage of this great product and the government incentives” Consolidated Properties Group, Executive Chairman, Don O’Rorke advised. For sales enquiries, contact our team on 1300 301 774 seven days a week, or email sales@www.cornerstoneliving.com.au, or visit The Cornerstone Living Sales Office and Café at 88 Troughton Road, Sunnybank QLD 4109, open Wednesday to Monday 10.00am to 4.00pm. *Based on 90% lend on $399,000 at an interest rate of 3.99% for 30 yrs.